Morning all! I hope you've had fabulous weekends, I did a spot of successful shopping and just made the most of catching up on rest. 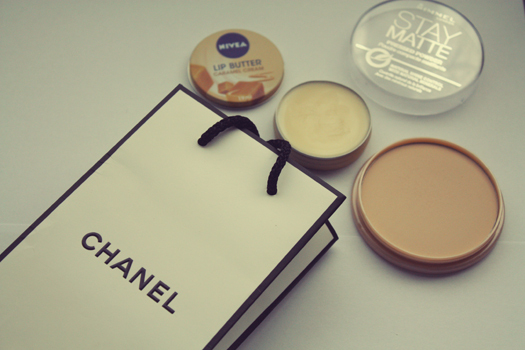 Today though I am going to share with you two of my favourite low-end beauty buys of late. I really want to do more posts like this so if you have any product recommendations then do leave a comment below or send me an email. Nivea Lip Butter * You all know how much I love my Korres lip butters. When I saw Ingrid mentioning the Nivea Lip Butters in one of her favourites videos I hoped they'd make their way to our shores..and they did. Nivea Lip Butters are designed to restore and maintain healthy and soft lips. With ingredients like Shea butter and mild Almond oil, lips are protected and dry skin is reduced. I was given the Caramel Cream lip butter and it smells delicious, like butterscotch or a caramel ice cream sundae. The lip butter itself is super soft on the lips and you aren't left needing to reapply this frequently, which can dry out the lips. I have noticed my lips are a lot less dry & definitely feel smoother. Next we have Rimmel's Stay Matte Powder. This is highly recommended by beauty guru Tanya Burr and countless bloggers. Recently when I wanted to earn some beauty club points at a local department store I took the plunge and added this to my shopping list. Rimmel's Stay Matte powder is formulated with natural minerals and is designed to provide shine control for up to five hours. As someone with skin that can be a bit shiny sometimes I try to avoid the dewy finish look. As a result, matte powders are my best friend. This powder really delivers, it provides the perfect amount of coverage and shine control. It lasts a good six and a half hours before needing touch ups. If you're after a high quality powder at a fraction of the price then you need to add this to your makeup bag. ♥ Nivea Lip Butters are $5.50 and will be in stores from Mid-April. 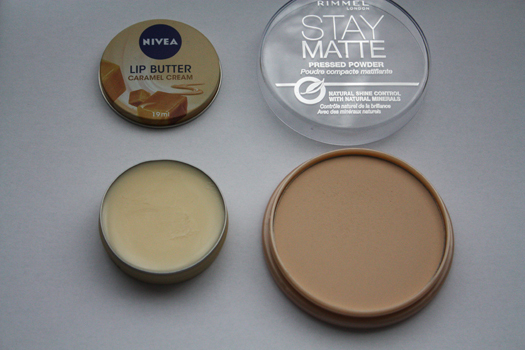 ♥ Rimmel Stay Matte Powder is available here. Rimmel's products are currently on sale on ASOS as an added incentive! I have noticed they don't have the shade I used (Transparent) but most of the other shades are available. If you're in New Zealand you can also pick this up at Farmers, The Warehouse or Kmart. Colour & Sparkle with Mac!